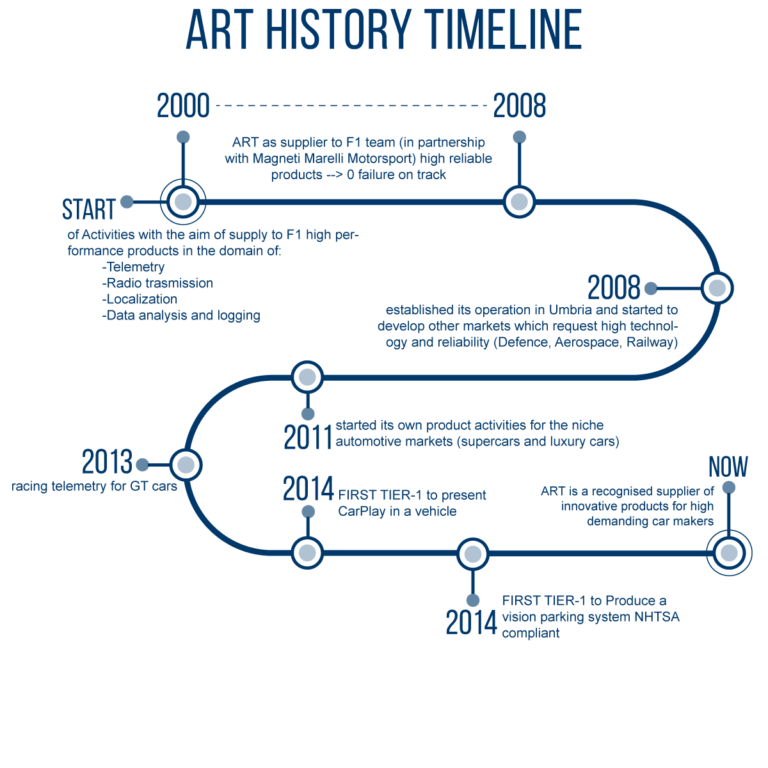 ART – ADVANCED SOLUTION WAS FOUNDED IN 2000 BASED ON THE EXPERIENCE OF UMBRIAN ENTREPRENEUR GIANCARLO LUIGETTI, WITH THE GOAL OF SUPPLYING HIGH-PERFORMANCE PRODUCTS FOR FORMULA ONE, ESPECIALLY IN TELEMETRY, RADIO TRANSMISSION, LOCALISATION, DATA ANALYSIS AND LOGGING. ART was thus a supplier of technological products for Formula One teams, in partnership with Magneti Marelli Motorsport: and we made no in-race mistakes. But we have maintained our ties with the F1 world since then, and continue to supply teams with our data gathering and processing products and positioning systems. In 2008 ART set up its operational offices in Umbria, at the Villa del Pischiello in Passignano sul Trasimeno, and made available its skills to markets which need high technology and reliability, such as defence, aerospace and railways. .
2011 saw the start of ART’s production work, with the direct development at its offices of solutions and components for the supercar and luxury car markets; with its first product line. The excellent results obtained in terms of performance, reliability and versatility have meant the company has been able to increase its work in Motorsport. In 2014 RT became the first Tier-1 supplier to fit Apple Carplay to a vehicle, and the first Tier-1 firm to produce an NHTSA-compliant parking assist system; these are two results that have allowed the company to now be recognised at an international level as a trusted supplier of products for a market, the automotive one, which every day proves to be increasingly demanding and innovative. Production work begins with the direct development of solutions and components for the supercar and luxury car markets.